P.W. Bridgman (a pen name) is a Pushcart Prize-nominated writer of short stories, flash fiction and poetry who lives in Vancouver, British Columbia, Canada. He has earned undergraduate and postgraduate degrees in psychology and a degree in law. In 2018 he was one of nine participants in the intensive writing summer school program offered by the Seamus Heaney Centre for Poetry at Queen’s University, Belfast — an experience that he says was a defining one in his writing life. 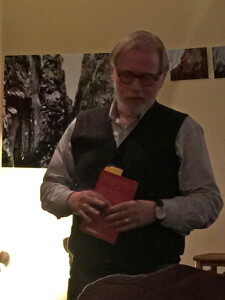 Bridgman has done many public readings of his work at literary venues in the Lower Mainland of British Columbia and abroad (including at the United Arts Club in Dublin, the Tchai Ovna Teahouse in Glasgow, the Open Studio in Melbourne and, most recently, the Accidental Theatre in Belfast). His writing has appeared, or is forthcoming, in (among others) The Moth Magazine, The Honest Ulsterman, The Glasgow Review of Books, Poetry Salzburg Review, RIC Journal, The Galway Review, The Bangor Literary Journal, Litro UK, Litro NY, The High Window, Pif Magazine, Praxis Magazine, Grain Magazine, The Antigonish Review, Ars Medica, Ascent Aspirations, Patchwork Paper, The New Orphic Review, London Grip, A New Ulster, Easy Street, Section 8 Magazine, Pottersfield Portfolio, The Mulberry Fork Review and Aerodrome. His works have won prizes or been finalists in several competitions, both in Canada and abroad. Some of his short stories and flash fiction pieces are represented in anthologies published in Ireland, England, Scotland and Canada. His first book of poems, entitled A Lamb, has just been published (in September, 2018) by the independent Canadian literary publisher, Ekstasis Editions. 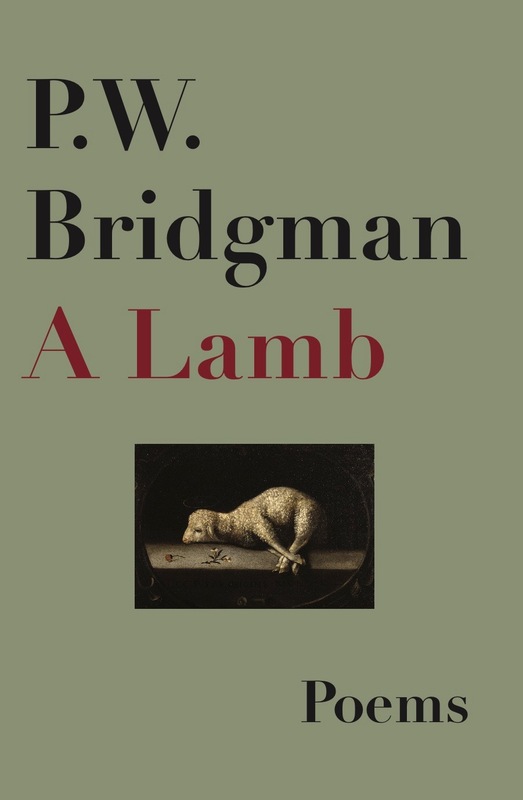 A second collection of Bridgman’s short fiction is nearing completion. A second book of poems is also in preparation. Every December the Glasgow Review of Books invites those who have published original fiction or poetry in its pages to contribute a “Reads of the Year” year-end summary of their most highly-recommended fiction, non-fiction and poetry titles. This year, the books that P.W. chose to enthuse about are Jonathan Tulloch’s wry, clever and exceptionally droll Larkinland (Bridgend: Seren, 2017) and Mark L. Winston and Renee Sarojini Saklikar’s informative and inspiring Listening to the Bees (Gibsons: Nightwood Editions, 2018). To read P.W.’s take on both of these memorable books, follow this link to the Glasgow Review of Books webpage. P.W. submitted the winning entry in the all-age English language category for the Edinburgh-based Scottish Book Trust’s 50-Word Fiction Competition for November, 2018. The rules required that submitted stories be set at a music festival. You can read P.W.’s winning story by clicking here and scrolling down the “previous winners” page to the November 2018 entries. The Honest Ulsterman — that marvellous, Derry-based literary journal with the much-storied history — has published in its October, 2018, issue an in-depth interview of P.W. by Vancouver’s own Anne E. Giardini. You may read the interview online by clicking on this link. And, while visiting the October issue of The Honest Ulsterman, be sure to take some time with the many fine poems, stories, interviews and the like to be found there. Your attention is drawn particularly to the piece on P.W.’s fellow Ekstasis Editions author Gregory J. Dunne (click here), Bangor Literary Journal founder and editor Amy Louise Wyatt’s exquisitely elegiac poem, “Memory Box” (click here) and Milena Williamson’s artful poetic response, entitled “Summation of an Infinite Series,” to Seamus Heaney’s poem, “Postscript” (click here). P.W. is honoured to have had his short story, “The Four-faced Liar,” published by the much-respected Irish literary journal, The Galway Review. With just shy of 400,000 online readers from all around the world, the GR is a significant print and online presence in contemporary fiction and poetry. Having chosen The Four-faced Liar and Other Stories as the provisional title for his next book of sort fiction (which is almost ready to be circulated to interested publishers), P.W. is pleased to have had the lead story in his current work-in-progress accepted in such a prestigious and widely read literary magazine. You can read “The Four-faced Liar” online by clicking here. Be there or be square! 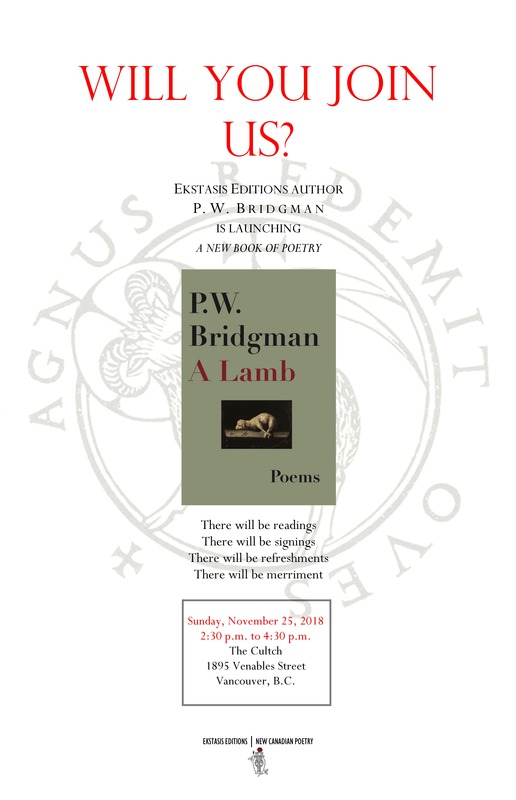 The Vancouver launch of P.W.’s new book of poems – A Lamb – will take place at the Vancouver East Cultural Centre (the “Cultch”) on Sunday, November 25, 2018 from 2:30 to 4:30 p.m. There will be readings. There will be signings. There will be refreshments. There will be merriment! Mark your calendars. The Cultch is located at 1895 Venables Street (at the corner of Victoria Drive) in uber-Bohemian East Van. West-siders have no fear! No shots are required before crossing over Main Street. 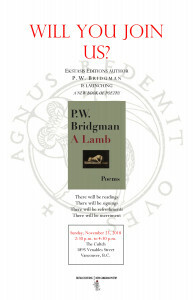 More on the subject of P.W.’s just-published volume of poems entitled A Lamb (Victoria: Ekstasis Editions, 2018). On September 20, 2018, his very generous friends and mentors at the Seamus Heaney Centre for Poetry at Queen’s University, Belfast (“SHC”) provided some welcome exposure for A Lamb through the Centre’s social media channels. That is, SHC made mention of the publication of A Lamb on both its Twitter and Facebook feeds that day. Such postings can soon be difficult to find as time marches on. Therefore, readers wishing to see the SHC tweet announcing the publication of A Lamb will be taken to it directly by clicking here. A screen grab of the other posting — that is, the SHC Facebook announcement — is reproduced below. The image of the Facebook posting will become perfectly legible if you enlarge it by clicking on it twice. P.W.’s enthusiastic thanks go out to Rachel Brown, coordinator at SHC, and all of the other fine people there — most especially the overwhelmingly talented SHC Fellow, Doireann Ní Ghríofa, for being such a kind, exacting and supportive mentor and teacher. Like a much-anticipated second child who finally emerges from the delivery room healthy and with all fingers and toes accounted for, P.W.’s second book at last (on September 10, 2018) rolled off the presses at Ekstasis Editions. Entitled A Lamb, this new volume of mostly narrative poetry can now take its rightful place on the bookshelf alongside P.W.’s first book (a selection of short fiction published in 2013 entitled Standing at an Angle to My Age). P.W. is especially pleased to have A Lamb appear under the colophon of the highly respected literary publisher, Ekstasis Editions. Ekstasis has been a prominent feature of Canada’s literary landscape for decades. Commencing in 1982 it has brought out more than 350 titles, beginning with editor-in-chief Richard Olafson’s Blood of the Moon, now a Canadian classic. Included among the many fine authors whose poetry has been published by Ekstasis are bill bissett, Michael Bullock, Leslie Choyce, Gwladys Downes, Jan Drabek, Margaret Dyment, Len Gasparini, Stephen Guppy, Gillian Harding-Russell, Cornelia Hornosty, Eileen Kernaghan, Susan McCaslin, Nellie McClung, Michael McClure, Florence McNeil, Sue Nevill, P.K. Page, Andrew Parkin, Linda Rogers, Steven Scobie, Bruce Serafin, Robin Skelton, K.V. Skene, Glen Sorestad, Richard Stevenson, Pete Trower, David Watmough and Carolyn Zonailo. 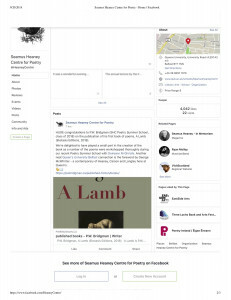 Watch this space, and the “Upcoming Events” page on this website, for updates regarding launches, readings and other activities surrounding the publication of A Lamb. P.W.’s poem, “Still Life with Traces of Movement: St. John’s Wood, 1931,” has been published by The High Window in its Issue No. 11 (Autumn, 2018). You can find it by clicking here and then clicking again on the “P.W. Bridgman” link. The High Window Press is the publisher not only of its eponymous literary review but also of many collections and selections of work by some of Britain’s most respected modern poets, including editors David Cooke and Anthony Costello themselves. David Cooke’s heartfelt, and unsentimental, tribute to Seamus Heaney (written in 2013 following Heaney’s death) is one of the best yet seen. You can read and savour the tribute yourself by clicking here. 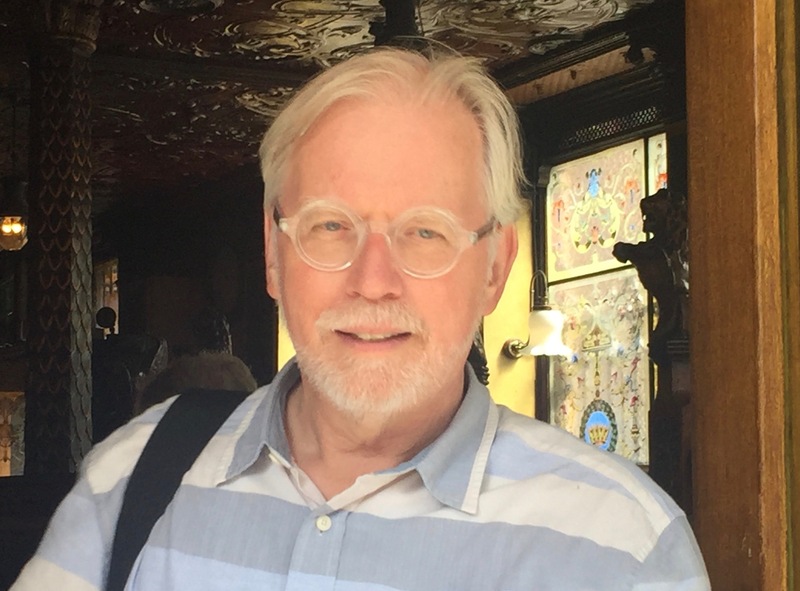 Titles forthcoming from The High Window Press include James W. Wood’s Building the Kingdom: New and Selected Poems, due in 2019. James W. Wood is an expatriate Scot who now lives near Vancouver (on Bowen Island) and whose reputation as a poet and literary critic of considerable talent and accomplishments is well-deserved. On May 15, 2018, the winners, those on the short list and those on the long list for this year’s Fish Poetry Prize were announced. Congratulations to Janet Murray of Sheffield, England, whose poem “Vernacular Green” was the winning entry. P.W.’s poem, “Dream, Interrupted,” made the 2018 long list. The judge of the poetry competition was Ellen Bass — author of, among other titles, Like a Beggar, published in 2014 by Copper Canyon Press. Her predecessor judges in previous years include Billy Collins, Brian Turner, Leanne O’Sullivan, Michael McCarthy, Peter Fallon, Matthew Sweeney, Paul Durcan, Ruth Padel, Nick Laird and Jo Shapcott. The Fish Prizes are administered by Fish Publishing of Bantry, Co. Cork and an anthology of the winners and finalist poems, short stories and flash fiction entries is published each year. 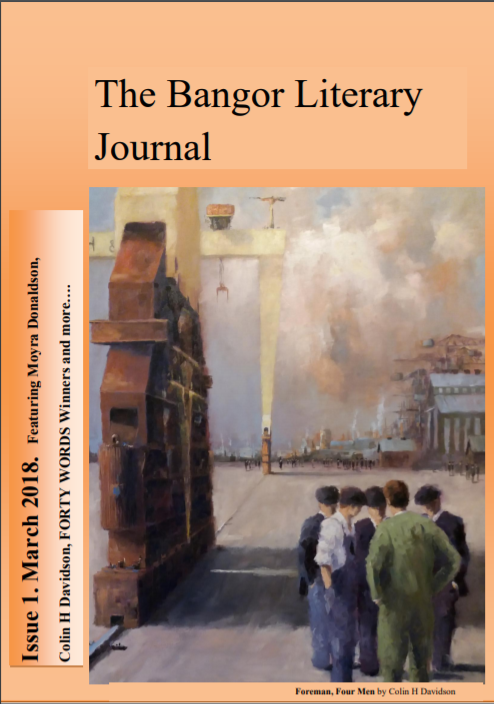 The Bangor Literary Journal is a fast-rising new presence on the literary scene in Northern Ireland and it is making great strides in giving exposure to the work of both established and emerging writers from N.I. and around the world. The journal features intriguing fiction, poetry and artwork. P.W. is pleased to have had another poem accepted and now published in its second issue. The poem’s title is “The Things He Grasped with Both Hands (A Lamentation in Thirty-six Bars)” and can be viewed online by clicking here and then scrolling down to page 50. But please, don’t stop there. There’s a whole lot of good reading to savour in this second issue, including a great feature interview with, and several poems by, Colin Dardis (at pages 29 to 35) and a lovely, wistful poem called “Plugging Gaps” by Amy Louise Wyatt — one of the journal’s editors — that makes use of gentle repetition to produce a most pleasing effect. You will find that one at page 69. 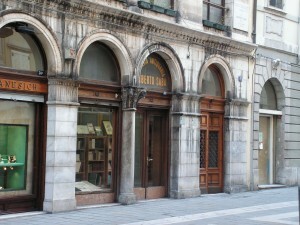 The RIC Journal is published simultaneously in Jaipur and Paris. It is truly an eclectic outlet for creative literary content from India, France and around the world. It publishes poetry, to be sure. But the categories of what appears in its online pages are open and far from conventional. They include “Iconotopsies”–dissections and analyses of art objects and their histories–as well as dreams, impressions and the like. There is a category of content identified as “Apocrypha,” involving interviews with, or “new” writings by, people of note or reputation who have long been dead. At the time of writing, the most current of these include a poem by the experimental Brazilian novelist Clarice Lispector (who wrote no poetry) and a bizarre and surreal interview with Eva Braun. P.W. has managed to storm the RIC Journal‘s avant garde ramparts with a love poem entitled “Living With Me Now in Green Dolphin Street.” You can see it here by clicking on this link. Now comes a “recent development” that truly stands out. It may even call for celebration. 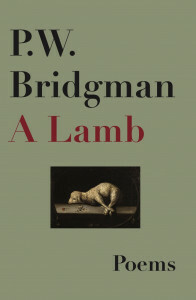 Later this year Ekstasis Editions–one of Canada’s most well-established and respected publishers of poetry and literary fiction–will publish P.W.’s first book of poems, entitled A Lamb. P.W.’s poem, “We Strive to Dismiss Their Prejudices with Good Humour (A Lamentation in 7/4 Time)”, was recently shortlisted in the Federation of British Columbia Writers 2018 Literary Writes Poetry Competition. The competition was judged by distinguished Victoria-based poet, Patricia Young, and first prize was awarded to Barbara Black, a very accomplished poet and musician. Congratulations, Barbara. The Bangor Literary Journal has accepted P.W.’s poems “Don’t Touch that Dame” and “Not the Way a Bullet Leaves a Gun” for publication in its inaugural issue. 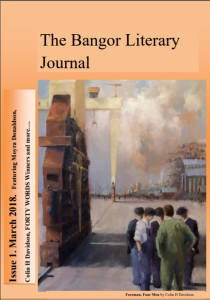 This new literary review originates (nor surprisingly) from Bangor, not far from Belfast, and the inaugural issue (which, fittingly, has a “firsts” theme) appeared online on February 28th. That issue and its contents can be accessed by clicking on this link. The last time P.W. had a story appear in The Antigonish Review was in (can it be?) … 1992. Its title was “So and Not Otherwise” and the story was also included in his book of short fiction, Standing at an Angle to My Age, released in 2013. The Antigonish Review (which is administered through the English Department at St. Francis Xavier University in Antigonish, Nova Scotia) has published P.W.’s somewhat surreal story/prose poem “Sinking and Surfacing.” You can find it in issue 193 (Spring 2018). As happened last year, the fine people at the Glasgow Review of Books have asked their contributors of original fiction and poetry to pen personal, year-end reviews of the titles that, for them, truly stood out in 2017. By clicking on this link you can read an appreciation of two new works of fiction plus a collection of poetry from an earlier time that P.W. chose to discuss in his GRB “Reads of the Year, 2017″ contribution. The featured authors are Vancouver short story writer and novelist Cynthia Flood (What Can You Do), Glasgow-based short story writer and novelist Bernard MacLaverty (Midwinter Break) and deceased Italian poet and novelist Umberto Saba (The Selected Poems of Umberto Saba). But don’t stop there! Other GRB contributors’ “Reads of the Year” pieces make for lively reading in and of themselves; they also provide some very helpful suggestions about what might be snapped up during the January sales to ensure that reading for pleasure in 2018 starts off agreeably. If you would like to have fresh new poetry and visual art delivered like a cappuccino and hot croissant to your computer screen every Friday, it is dead easy to subscribe to Friday Poems. Just scroll down to the “Subscribe” feature at bottom of the page to which this link will take you. Cheery news has just come in from poet and retired computational mathematician, Michael Bartholomew-Biggs, the genial poetry editor of London Grip. He writes to say that he has chosen P.W.’s poem about mean boys, entitled “Lych Gate and Yews: A Tableau Vivant”, for inclusion in London Grip’s March 2018 issue. The March issue, somewhat unusually, features longer poems. You can read P.W.’s poem by clicking on this link. Seattle-based Pif Magazine published P.W.’s flash fiction piece entitled “Visitations” in its October 2017 issue. You can read “Visitations” by clicking here. But wait. There’s more. Pif has also published P.W.’s poem, “Jim Begins to Consider Himself (A Performance in Ten Degrees)”, in its November 2017 issue. You can see that poem here. There can be few more storied Irish literary periodicals than The Honest Ulsterman. Its first issue was released in 1968. James Simmons was the editor. From its beginnings HU has presented Northern Irish writers alongside poets, prose-writers and critics from around the world. 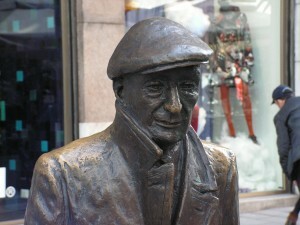 Early issues included work by Stevie Smith and Tony Harrison, as well as by Gavin Ewart, who continued to contribute until his death. It went on to include work from all parts of Ireland and Britain, the USA and Canada, Australia and many other places. 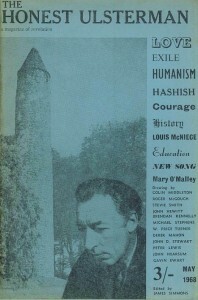 Its beginning coincided with the emergence of a remarkable generation of poets, including Seamus Heaney, Michael Longley and Derek Mahon, but it also provided an early, often the first, platform for subsequent waves of writers such as Paul Muldoon, Ciaran Carson, Medbh McGuckian, and numerous others. 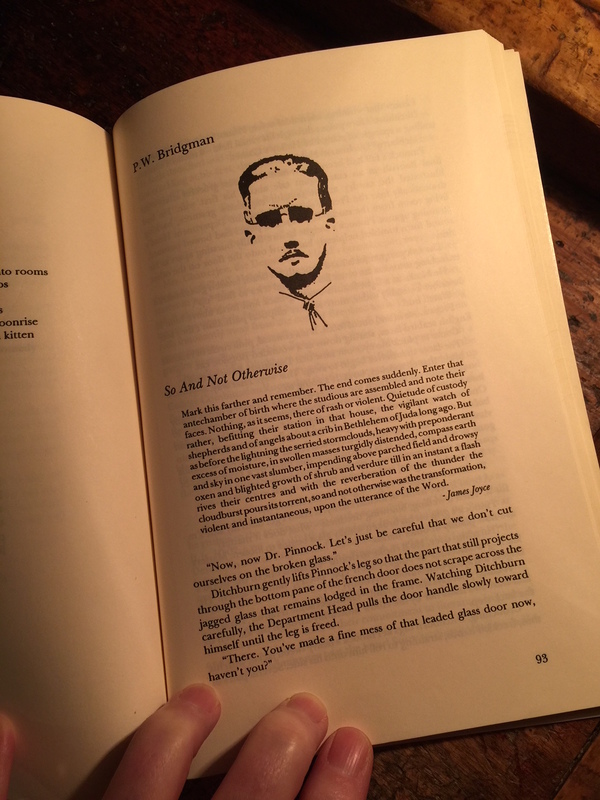 The June, 2017, issue of The Honest Ulsterman includes P.W.’s poem, “Out of the Bar and Into the Black Belfast Night.” You can have a look, here. While you’re at it, take some time to read some of the other great fiction and poetry in the June issue. And don’t miss Greg McCartney’s thoughtful interview with Jacob Polley. Jacob’s brilliant fourth book, Jackself, was awarded the T.S. Eliot Prize in 2016 — most deserving recognition. That interview can be accessed by clicking on this link. Easy Street, the outstanding American online “magazine of words and culture,” has published a gratifyingly insightful review of P.W.’s short story collection, Standing at an Angle to My Age. It is plain that the reviewer, Angela Kubinec, has thought deeply about the stories. In a lyrically written review, she has integrated her responses to them with certain aspects of her own life experience that the stories have evoked. You can read the review here. Vol. 12, no. 1 (2017) of Ars Medica is now available online. 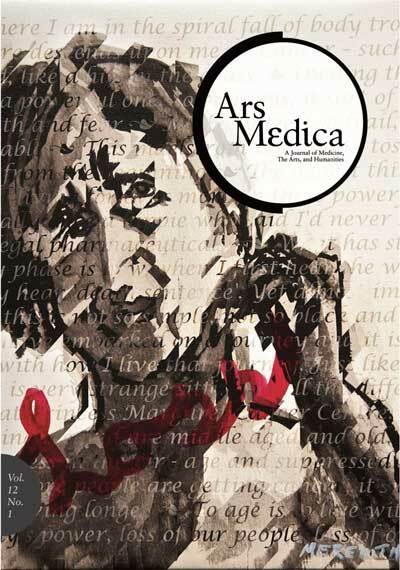 Ars Medica is subtitled A Journal of Medicine, the Arts and Humanities and it publishes literary fiction, nonfiction and poetry that confront the intersection of those diverse, but nevertheless related, callings. P.W.’s poem, entitled “Consent to Orchidectomy,” appears at pp. 46-49. You can read it (and, indeed, all of the contents of that issue of Ars Medica) by clicking here. We know that like all fallible humans, physicians sometimes stumble and “Consent to Orchidectomy” considers an example of that. It is greatly to the credit of the editors of Ars Medica that they were willing to publish a poem that deals with the occasional failings of members of the medical profession. It is through open discussion of uncomfortable topics that we learn. P.W. 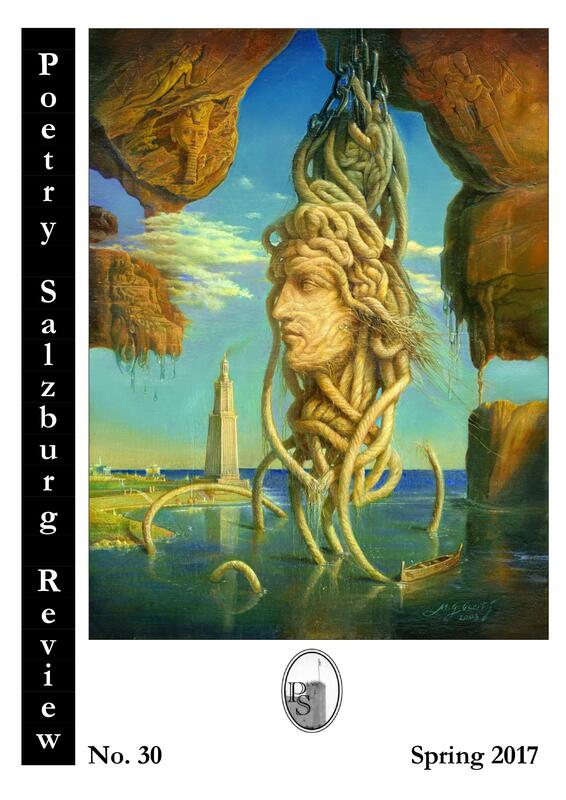 is happy to have his poem, entitled “Time’s Forward Gear,” published in the spring 2017 issue of the Austrian print journal, Poetry Salzburg Review. 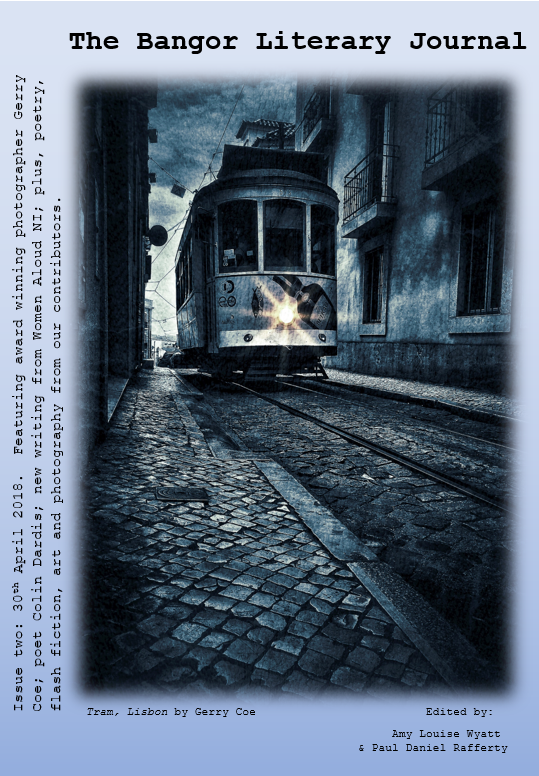 The PSR is an English language publication edited by Dr. Wolfgang Gortschacher with a wide, international readership and a diverse stable of established and emerging contributors. Among those appearing with P.W. in the current issue are 2016 Forward-Prize-winning, Trinidadian-born poet Vahni Capildeo and M. Stasiak, an ex-pat Canadian now living in London. P.W. extends his thanks to the great writers, poets and spectators who showed him such a warm welcome at the “To the End of the Verse” reading series in Melbourne, Australia. 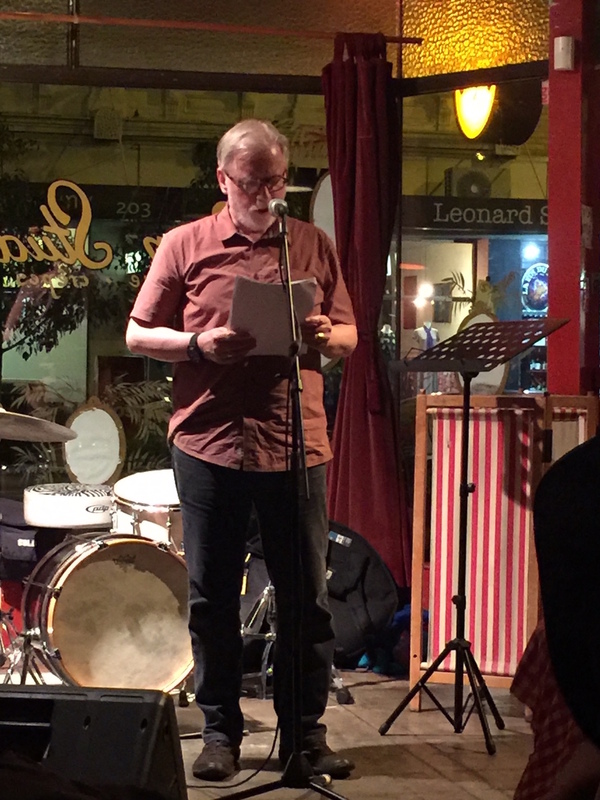 As happens monthly, a number of poets and spoken word artists gathered on March 21st to read from their recent writing at The Open Studio, 204 High Street, Northcote. The quality of the work was remarkably high. Perhaps most memorable of the evening’s lineup were Monster Mike (whose offerings included an extraordinary rendition of “Waltzing Matilda” in the style of Tom Waits), and Yuri (whose lively, energetic and articulate reading was positively hypnotic). Australia (Melbourne particularly) is blessed with a very vibrant and creative literary culture. 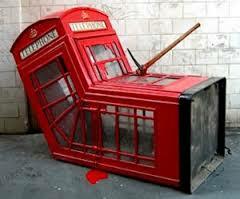 Watch for a couple of poems by P.W. that have just appeared in Easy Street (“Low Horse on a High Road: Variation on a Theme by Gershwin” and “At the Corner of Triumph and Pandora”). These complete P.W.’s Julian Capstick trilogy, the first of which–entitled “Single Helix”–appeared in Easy Street in April, 2016. The editors of the Glasgow Review of Books kindly invited P.W., along with other contributors of poetry and fiction to the GRB‘s pages over the past year, to offer up their “good reads” for 2016. P.W. chose to celebrate poetry recently published by Karen Solie, short stories recently published by Colin Barrett and an old chestnut of a book of poems by George MacBeth released in the late 1960s. If you’re minded to see what lifted P.W.’s literary spirits in an otherwise rather dispiriting year, click here. P.W.’s poem, “Somebody Shot President Kinney,” was chosen as a Friday Poem by David Fraser for publication on his Ascent Aspirations literary website for Friday, November 18, 2016. To read that remembrance of the Kennedy assassination, as refracted through perplexed younger and older eyes, scroll down within the archived Friday Poems for 2016 on the Ascent Aspirations website (by clicking here) until you reach the entry for November 18th. On October 12, 2016, P.W.’s short story entitled “No Writers Were Harmed in the Making of this Whiskey” was published by the Glasgow Review of Books. You can see it by clicking here. Set in a small village in Northern Ireland, “No Writers …” is a dark meditation on human fallibility and its sometimes tragic consequences. The appearance of the story in the Glasgow Review of Books‘ pages is accompanied by an extraordinary image by world-renowned photographer and Emily Carr University of Art and Design professor, Art Perry. On October 6, 2016 (National Poetry Day no less! ), the online American literary journal, Praxis Magazine, published P.W.’s poem, “I’ve Asked the Iscariots Over for Potluck and a Game of Bridge.” The poem vaults biblical characters forward in time to the 1960s and recasts them, with a frisson of mildly irreverent humour, as ordinary, plainspoken folk in small town Canada. P.W. is honoured to have had his story, “But No, Nothing,” chosen as the feature podcast for International Podcast Day (September 30th) on Wisconsin-based Bob’s Short Story Hour. Robert (or Bob) Daun is the creative force behind the podcast site (accessible by clicking here). Bob has an abiding love for the short story form and for storytelling. He has a particular love for the oral tradition and he recognises that the experience of hearing a story told well is qualitatively different from that of reading one. Thus, about a year ago he created Bob’s Short Story Hour. Since then he has put up podcasts of many short stories by many writers on his site, accompanied sometimes by incidental music by Bob and others. (Bob is also a very skilled guitarist.) Bob’s Short Story Hour opens a different kind of window onto short fiction–some from the classics but much more written by contemporary writers hailing from many places. If you are looking for a restful evening’s literary entertainment, or perhaps for something diverting to play via Bluetooth through the audio system in the car on a long drive, dial in Bob’s Short Story Hour and give it a listen. New short stories appear regularly and there is an archive of everything posted since the site’s inception that you can tap into. Section 8 Magazine, a print and electronic journal based in Seattle, has published in its online version a short story by P.W. entitled “Smothered Mate”. Section 8 Magazine has previously published a flash fiction piece of P.W.’s entitled “Indirection”. The American literary e-zine, Easy Street, “provides writers a venue to discuss the publishing industry, to showcase their own work, and to share viewpoints on diverse aspects of contemporary life and culture”. It is chock full of high-quality fiction, non-fiction, poetry and commentary. P.W.’s dark and moody poem, “Single Helix,” was published by Easy Street at the end of April, 2016, and can be accessed via this link. Robert Daun, from Wisconsin, U.S.A., has recently launched a very fine website indeed. It features podcast readings of short fiction. This is a welcome development for those who recognise that short stories are meant not only to be read but also to be heard. Mr. Daun’s website is called Bob’s Short Story Hour and episode 4 on that site contains a podcast of a reading of P.W.’s story, “But No, Nothing”. You can access the podcast online by clicking on this link. 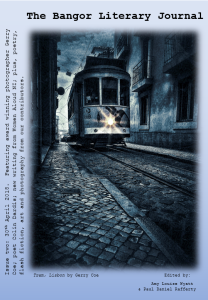 ”But No, Nothing”–a consummately Irish story–was selected for recognition for Excellence in Contemporary Narrative and inclusion in the 2014 Gem Street anthology published by Labello Press of Conmel, Co. Tipperary, Ireland. 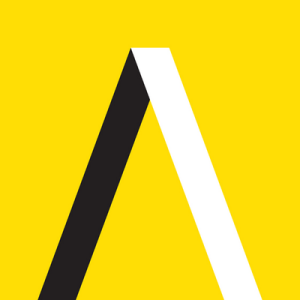 P.W.’s poem, “Safari Not Supported but Your Prayer is Important to Us,” has now been published in Aerodrome, a marvellous a literary journal based in South Africa. You can see P.W.’s poem in Aerodrome online by clicking here. P.W. 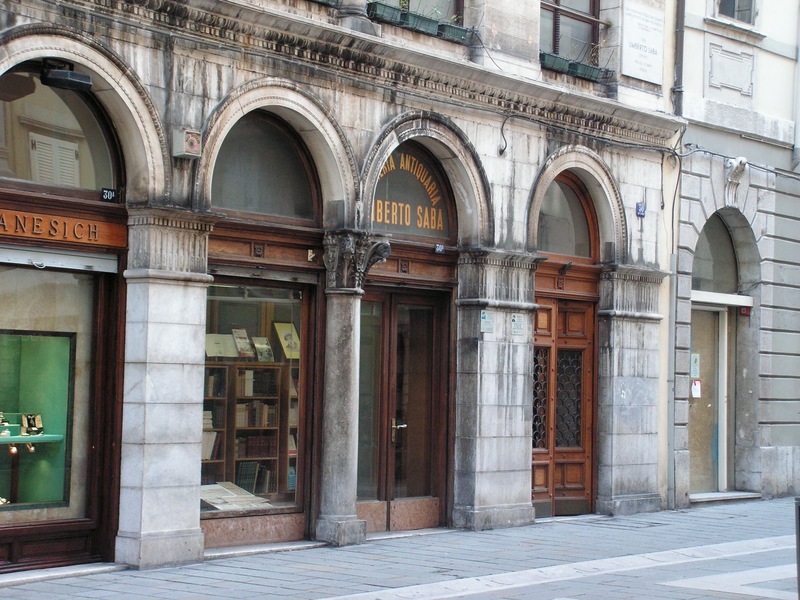 has had work appear before in Litro, an arts and culture magazine headquartered in London that publishes a great deal of fiction and commentary. Litro has recently expanded to North America. Visit the New York-based LitroNY site to see a gritty little noir flash fiction piece authored by P.W., entitled “Shotgun Wedding: Vancouver, 1960″. Click here and your browser will take you directly to “Shotgun Wedding: Vancouver, 1960″. The website, London Grip, is (of course) headquartered in the U.K. Note the eye-catching logo. London Grip accurately self-describes as a “wholly independent online venue, a cultural omnibus providing intelligent reviews of current shows and events, well-argued articles on the widest range of topics, an exhibition space for cross-media arts and an in-house poetry magazine with its own editor”. P.W.’s poem, “The Nobility in That, or Not,” appears in the December 2015 issue of London Grip. The successful staging, in July 2015, of P.W.’s “The Mars Hotel” by talented contemporary dancers Ziyian Kwan and Noam Gagnon together with jazz trio Handmade Blade (that is, Peggy Lee on cello, JP Carter on trumpet and electronics and Aram Bajakian on electric guitar) was just a beginning. The dancers and musicians are continuing to develop the performance and they took it on tour to Victoria and Nanaimo in early 2017 and also presented it again at the Fire Hall Performing Arts Centre in February. Beyond that, discussions are also underway which, if successful, will result in touring performances of “The Mars Hotel” taking place in other cities across Canada. Very, very exciting. P.W.’s flash fiction piece, “A Summer Nativity: Vancouver, 1977,” has been published online by the edgy Scottish webzine, Word Bohemia, which is accessible by clicking on this link. On July 8 and 10, 2015, talented contemporary dancers Ziyian Kwan and Noam Gagnon joined forces with jazz trio Handmade Blade (that is, Peggy Lee on cello, JP Carter on trumpet and electronics and Aram Bajakian on electric guitar) to stage performances in movement and music built around P.W.’s flash fiction piece, “The Mars Hotel”. The July 8th performance sold out and the one on July 10th came very close to selling out as well. ”The Mars Hotel” was choreographed by Ziyian Kwan; Peggy Lee composed the original score. It formed part of the 2015 Dancing on the Edge Festival and was presented at the Fire Hall Performing Arts Centre on East Cordova Street, Vancouver. To see, en francais, a television interview of Ziyian Kwan and Noam Gagnon on CBC Vancouver’s French language channel in which footage of one of the final rehearsals for “The Mars Hotel” was aired, click on this link. An edited, six-minute video clip of highlights of the performance filmed on opening night at the Firehall Performing Arts Centre can be seen here. And to see a pre-performance interview of P.W., Ziyian Kwan and Peggy Lee by Janet Smith in the Georgia Straight, and a post-performance review of the performance by critic Matt Hanson published in Brooklyn-based Dance World, click here and here. 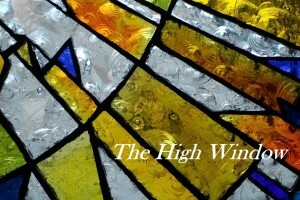 In the May, 2015 issue of A New Ulster–the Belfast-based online and print literary magazine edited by Amos Grieg of Lapwing Publications–you will find P.W.’s new story, “Even Unto My Death You Shall Be Judged”. P.W. sends out words of thanks to all who got behind Authors for Indies Day at hundreds of independent bookstores across Canada on May 2, 2015 by turning up, buying books, listening to readings and generally joining in the lively discussions that unfolded in each venue about our literary culture in Canada. 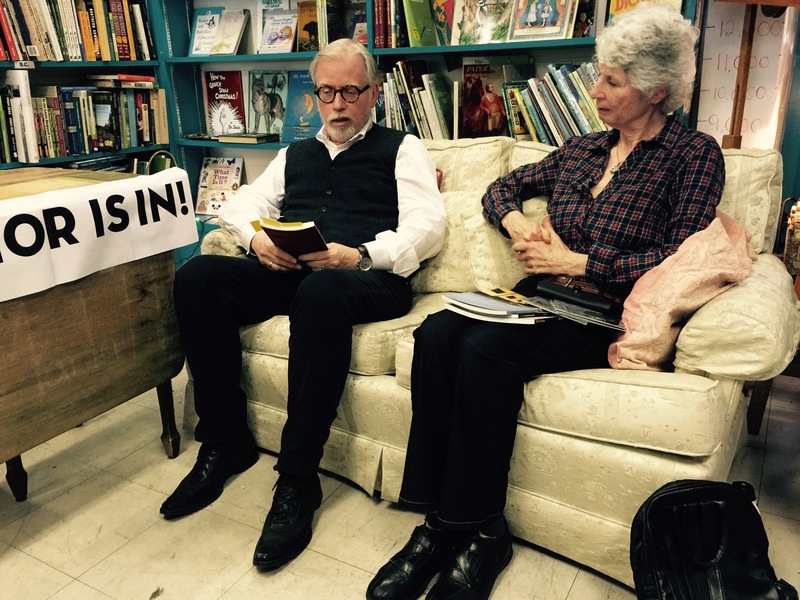 That literary culture badly needs a thriving network of independent bookstores to sustain and nurture it and the support shown for booksellers on May 2nd by authors and readers alike was heartwarming indeed. A special thanks goes out to Nancy who organised the readings at the People’s Co-op Bookstore on Vancouver’s edgy and uber cool Commercial Drive, and to Daphne Marlatt and Fiona Lam with whom it was P.W.’s pleasure to join in readings there. What fine, gracious women and magnificently talented poets! 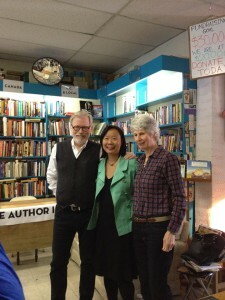 Below are a couple of photos taken at and after the readings at the People’s Co-op Bookstore on Authors for Indies Day. P.W. 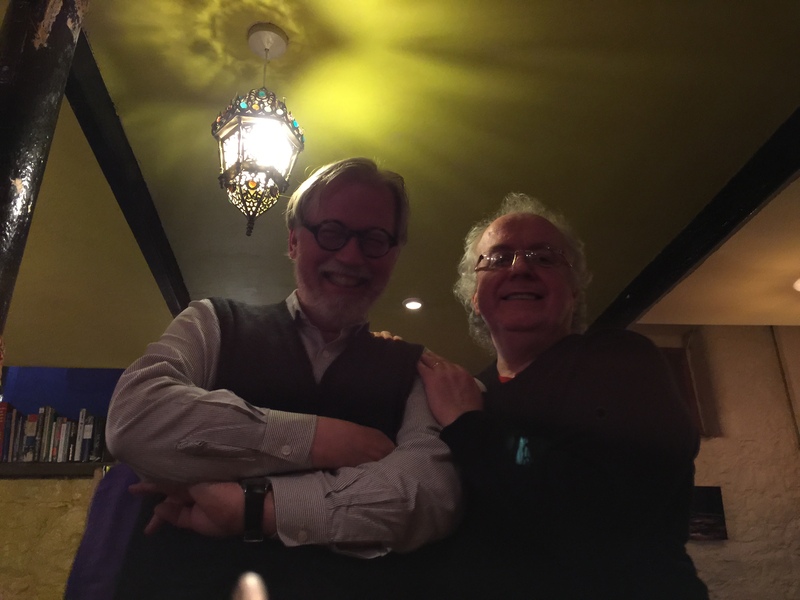 wishes to thank session leader Michael Kerins and all of the participants and audience members who were present in Glasgow’s West End on April 17, 2015 at the iconic Tchai Ovna Teahouse in Otago Lane where he (P.W.) had the privilege of giving a reading of some of his fiction from Standing at an Angle to My Age. Tchai Ovna is a venue where some of Scotland’s finest storytellers, poets and fiction writers gather to share their work with a discerning audience of listeners. P.W. was shown a very warm, Glasgow welcome and, as well, he appreciated the opportunity to hear some very fine storytelling by the others on the evening’s lineup. Never been to Tchai Ovna? Better hurry! Its future is threatened by a creeping luxury flats development that may, ultimately, result in its demolition. That would, truly, be a great pity. Tchai Ovna is an important and working part of Glasgow’s literary and indie music infrastructure. As some measure of that, consider the fact that the teahouse’s interior is featured in the cover art for Belle and Sebastian’s 2003 album, Dear Catastrophe Waitress. 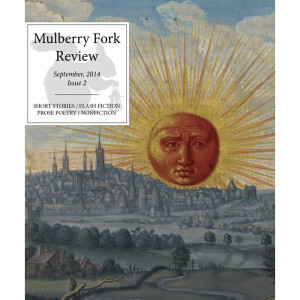 P.W.’s non-fiction piece, “Virginia Woolf and Pete Seeger, Inter Alios: A Meandering Rant on on Truth, Beauty, Love and Twitter” — which has been published in the U.S.-based Mulberry Fork Review – has received honourable mention in the Royal City Literary Arts Society’s “Write-on!” competition. Some happy news! The McGill University based literary criticism journal, The Bull Calf (which takes its name from the Irving Layton poem), has published a warm and generous review of P.W.’s book of short fiction, Standing at an Angle to My Age. Have a look at the Critical Reception/Reviews subpage on this website for an excerpt from the review and a link to the full text of it. 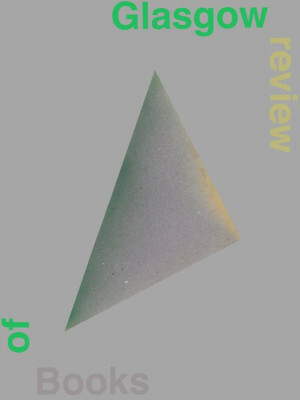 The Patchwork Paper–a UK-based magazine that presents contemporary poetry, fiction and photography to its online and print readers–has just published P.W.’s “Villanelle Moderne”. This dark little poem addresses a very modern kind of problem within a highly structured poetic form that some believe originated in Italy or Spain during the Renaissance. A villanelle comprises 19 lines and, using capitals for the refrains and lowercase letters for the rhymes, its form can be expressed as: A1 b A2 / a b A1 / a b A2 / a b A1 / a b A2 / a b A1 A2. ”Villanelle Moderne” is accompanied by a haunting photograph by Asia Wardzynska and is accessible online via this link. The Irish publisher, Labello Press, is currently running interviews with its Gem Street anthology contributors on its Labello News website subpage. You can access P.W.’s interview via this link. A nonfiction piece written by P.W.–entitled “Virginia Woolf and Pete Seeger, Inter Alios: A Meandering Rant on Truth, Beauty, Love and Twitter”–has been published at page 90 of the September 2014 issue of the American literary journal, The Mulberry Fork Review. P.W.’s short story, “The Colours of Love and Loss,” appears in an anthology entitled National Voices, published in November 2014 by the Canadian Authors Association. Copies of National Voices can be purchased directly from the CAA, online, via this link. Tá sé am chun ceiliúradh a dhéanamh! P.W.’s short story, “But No, Nothing,” was selected by Labello Press for an Excellence in Contemporary Narrative Award and inclusion in the Irish publisher’s Gem Street anthology for 2014. 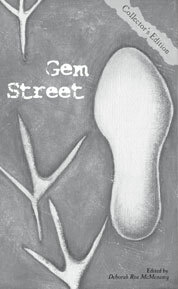 Released in August, the latest Gem Street anthology includes the 15 stories that were chosen as finalists in this year’s Leonard Koval International Short Fiction Competition. The authors whose work is represented in the 2014 anthology hail from England, Ireland, Northern Ireland, Scotland, Italy, U.S.A., Australia and Canada. P.W.’s story, “Dear Dark Head”–an adapted version of Ceann Dubh Dilis (which appears in Standing at an Angle to My Age)–was published in August 2014 in the Belfast-based print and online literary journal, A New Ulster. As well, a review of Standing at an Angle to My Age appears in the September, 2014 issue of that journal. P.W.’s ”Win, Win: A Miniature Vancouver Tragicomedy”–a story written in a satirical vein — can be accessed via this link. 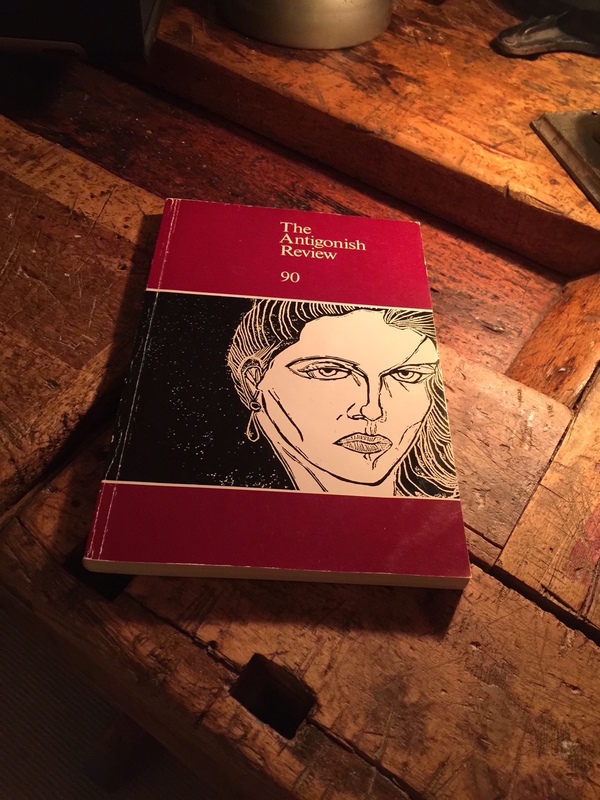 Despite its Vancouver-centric conceit, “Win, Win …” was published in the U.K. in Litro, an ultra-cool, London-based literary arts magazine with a print circulation of 100,000+ and a large online presence as well.